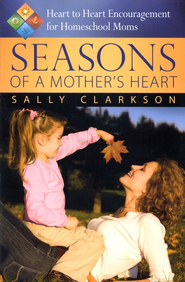 AMY at Hope is the Word is hosting a book club to discuss Seasons of a Mother's Heart by Sally Clarkson. It's been a few years since I've read this one and I think it's a good time to re-read it as I continue (always) to re-prioritize my commitments and schedule in the (bright) light of motherhood. Amy posted more about the book club HERE and included the schedule for chapter discussions. If you'd like to learn more about this, please visit Amy at Hope is the Word. I'll have to think about this one. My active mothering season is almost over (:-(), but I have been wanting to read Clarkson, partly for myself and partly to see if I would recommend her to other moms.